Some days, I feel like I’ve lost my mind. Let me back up for a minute, though. Until recently, I had a stable career. I worked in copywriting. I got promotions. I managed teams. I built a nice little résumé. It was pretty smooth sailing. Then, I gave it all up. I walked away. No more career. Done. You see, I always felt like there was something else I should be doing, but I could never figure out what that was. Nothing inside me was telling me which path to take. It was only telling me to find something else. Then, I reconnected with photography, and it’s as if this quiet voice inside me began to roar. THIS IS IT! This is your passion. This is what you need to do! Do it. NOW! So, I listened. But, that was nuts, right? I left a stable corporate career to be…an artist??? Maybe it is nuts, and some days, I feel insane for choosing to follow a passion where I will become more acquainted with rejection than I will with success. I chose to follow a passion where I have to put myself out there to be critiqued and judged—every day. Have I mentioned I’m a person who cares what people think? Some days, those critiques and judgments get to me, and I think, I must be crazy for doing this. I care way too much. I take things too personally. Maybe I’m not wired for this. Maybe I’m better off in the corporate world. That bubble was safer. It was comfortable. I had one of those days this week. I felt ready to give it all up. Then, today happened. I attended the Frisco Arts Ladies Who Launch, a monthly luncheon for Frisco’s entrepreneurial women in the arts. One of the guest speakers today was Janelle Hail, Founder and CEO of National Breast Cancer Foundation. As Ms. Hail was launching National Breast Cancer Foundation from her kitchen table nearly 40 years ago, there were people who told her it was not going to work, to give up. She never did, and she has spent decades saving lives through this organization she founded. When asked for her advice for those just starting out in their careers, whatever they may be, she said something I will forever remember in those future moments of self doubt. She said it’s important to not only stay focused, but also to remember that God placed this passion in your heart for a reason, and at the right times, the right people will come along to help you. I got teary-eyed (I can be a little sensitive). For me, Ms. Hail was that right person who came along at the right time to help me. I was needing a boost, a “go-get-’em kid,” a reminder to stay focused and not let critics, self-doubt or uncertainty roar louder than my passion. I went into that luncheon feeling a little blue, but thanks to Ms. Hail, I came out shining. Why am I sharing this with you? Probably because I’m nuts. The bigger reason, though, is because I know there may be someone reading this who needs that same reminder. 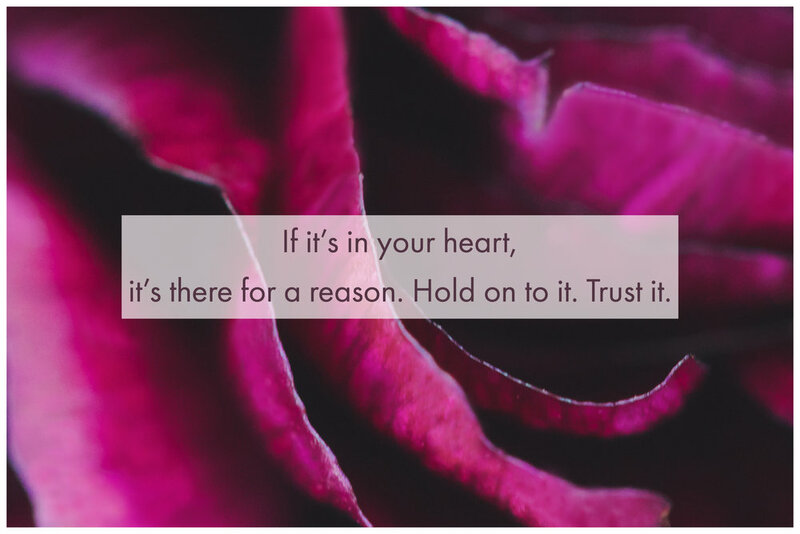 If it’s in your heart, it’s there for a reason. Hold on to it. Trust it. I am sure to have more of those moments that cause me to wonder if I’ve lost my mind. There is no doubt about that. But I’m going to remember Ms. Hail’s words and trust that voice that’s inside of me. I thank her for being that right person for me today. She may not have saved my life, but today, she did help save my sanity. Frisco Arts October Ladies Who Launch luncheon. Shown left to right: Julie Shipp, Gallery Director at Collin College; Christi LaMarca of Tilly & Fran; Janelle Hail, Founder and CEO of National Breast Cancer Foundation; and me.